It was probably an unwelcome sight for tech investors, who have watched some of the sector’s biggest names get clobbered for the better part of two months. 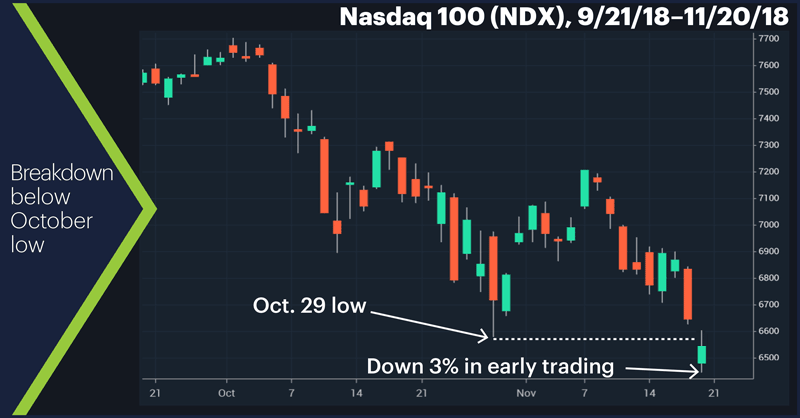 The intraday rebound that followed may not have cheered tech bulls who are now facing an NDX much closer to its February low (which is also around the 38.2% retracement level of the 2016-2018 rally) than its October high. But that wasn’t the real story. As the following weekly chart shows, yesterday the NDX also fell below a 25-week low that was followed by two higher weekly lows (i.e., the lows of the previous two weeks), something it’s done precisely two times since September 1985—the week of December 18, 2000 and the week of November 10, 2008. 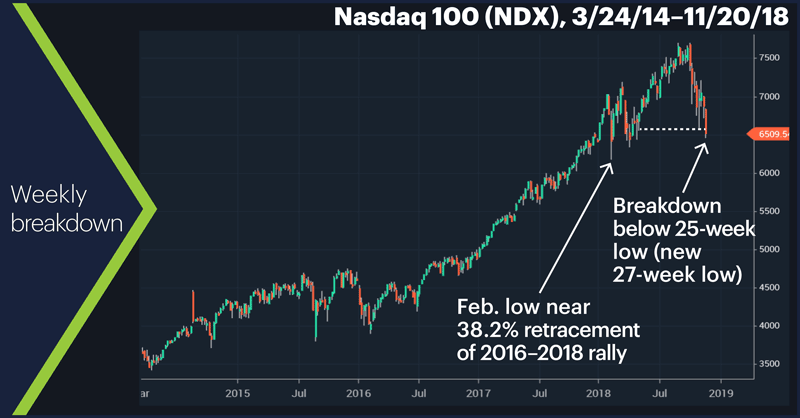 Of course, that’s not the only—or probably even the best—way to describe the NDX’s price action, but it does highlight how unusual it is for the NDX to penetrate such a significant (25-week or longer) low after rallying off of it for a couple of weeks. Even penetrations of shorter-term weekly lows that were followed by two-week bounces is a surprisingly short list. 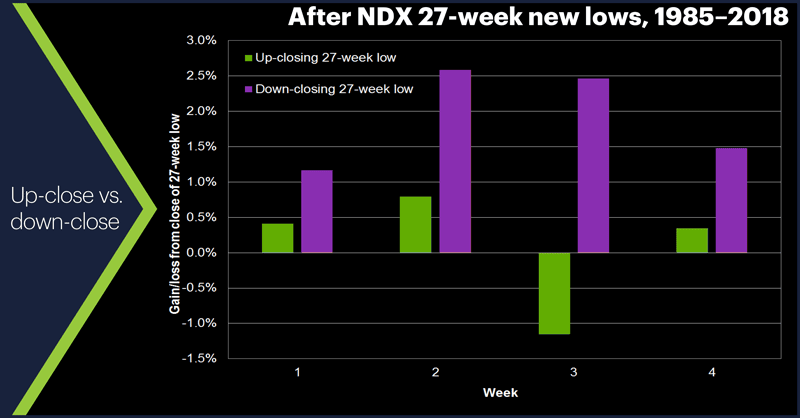 For example, there have been only 15 times that the NDX made a new four-week (or longer) low, traded above that low for the next two weeks, and then fell below it the week after that. Long story short, when the NDX spends at least two weeks trading above a significant swing low, it’s usually continued to move higher. That may give some bulls pause, despite yesterday’s modest intraday rebound. This pattern doesn’t imply anything about the longer-term trend, and current circumstances are going to dictate what the market does this time around, but it’s certainly something to consider as traders navigate a volatile tech environment. Market Mover Update: January crude oil futures (CLF9) dropped more than 7% intraday yesterday, falling below $53/barrel for the first time in more than a year. Today’s numbers (all times ET): Durable Goods Orders (8:30), Jobless Claims (8:30), Consumer Sentiment (10:00), Existing Home Sales (10:00), Leading Indicators (10:00), EIA Petroleum Status Report (10:30). Today’s earnings: Baozun (BZUN), Deere (DE), SINA (SINA), Weibo (WB).